Dear friends, do not believe every spirit, but test the spirits to see if they are of God...\"(1 Jn. 4:1). This work, the second volume of the Codification of the Spiritist Doctrine, explains how and in what ways spirits manifest themselves in the physical world and how to test them to determine if they are of God. The Mediums´ Book is the second of the five volumes comprising the Codification of the Spiritist Doctrine. Its author, Allan Kardec, explains that The Mediums´ Book combines \"the special teachings of the Spirits concerning the theory behind all Kinds of manifestations, the means of communicating with the invisible world, the development of mediumship, and the difficulties and pitfalls that may be encountered in the practice of Spiritism\". 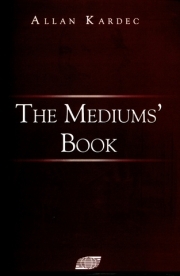 The Mediums´ Book is indispensable reading and provides priceless advice to Spiritists. It will always be a precious source of knowledge for any person who inquires into and considers the mediumistic phenomenon that has increasingly manifested itself throughout the world within or apart from formal Spiritist activities. Since we human beings are an integral part of the interchange between the physical and the spirit planes of life, it is best that we understand the mechanisms of this relationship as much as possible. The Mediums´ Book is the safest manual for all those who dedicate themselves to activities involving communication with the spirit world.